Our monthly membership meetings are a space to discuss upcoming advocacy efforts and collaborate with fellow community members on environmental justice issues. 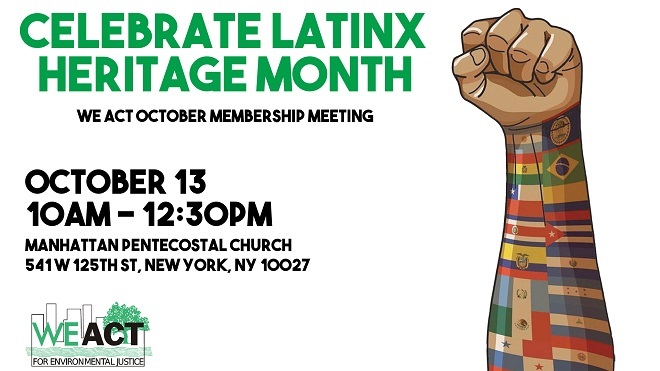 We invite you to join us on Oct. 13th for our next membership meeting as we celebrate Latinx Heritage Month, exploring the environmental justice movement in Latin America and the Caribbean and how Uptown can be in solidarity with our sisters and brothers in the Global South. And please note that this meeting will be held at the Manhattan Pentecostal Church. What is Latinx Heritag Month? National Latinx Heritage Month, which runs from Sept. 15th through Oct. 15th, is a time to recognize the contributions Latinx people have made in the US and celebrate Latinx people from all countries, including the Caribbean, Central and South America, and Africa. Latinx is a term for Latin Americans of diverse identities and orientations living in the US. Using this term does not mean we are trying to erase feminine and masculine identities, rather we are embracing all the identities of our community in Northern Manhattan and making sure that all Latinx people are seen and heard. Come join us anyway and enjoy our program focusing on grassroots international solidarity and environmental justice. If you like what you see and hear, then visit our membership page to learn more about the benefits of becoming a WE ACT member.